"Mave, can you hold this a minute?" I knew that request would come. 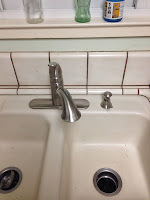 Randy put a new faucet in our kitchen this morning, and as soon as I saw him preparing to put it in, I was waiting for him to ask me to do my usual task during his repair jobs -- hold things. 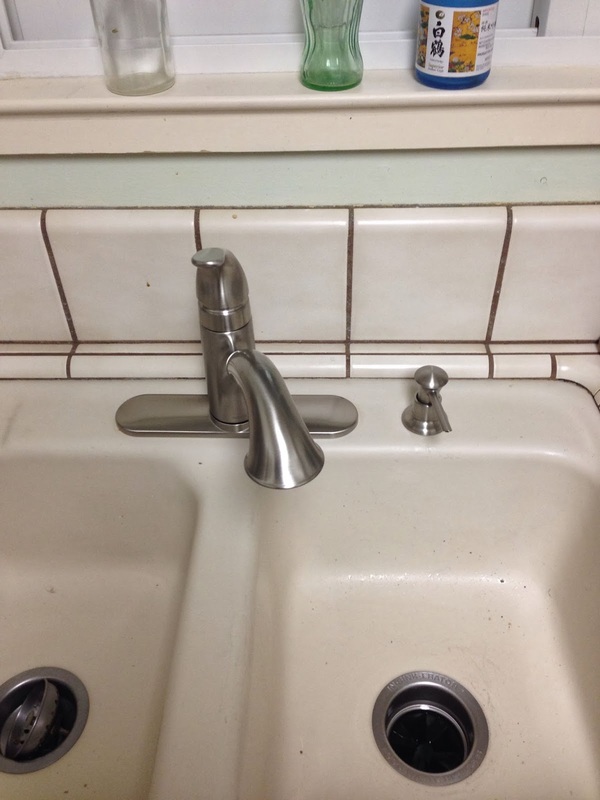 This time it was the faucet. Often it's a flashlight, or a cover or lid of some kind, or...whatever. It reminded me of a story I often tell of the worst "holding job" I've had during one of his many handyman projects. He was repairing the broken springs of the garage door several years ago. Do you know how heavy a garage door is? It is incredibly heavy! And those springs are huge and hard to connect. I was standing with my arms extended over my head holding the door up, as Randy strained to pull the other end of the spring into place. My arms began to tremble and I started to cry -- I knew if I let go, I'd kill my husband! When he finally said, "OK," I let go and there was a huge THWUMP as that door flew down. But it made it and we made it, and the garage door was fixed. I'm very thankful to have a handy husband, and although I've complained often about my menial holding responsibilities, they're a small price to pay -- usually -- for the benefit of our own personal handyman. It was kind of funny that my holding role came up again this morning. I had told the garage door story to some friends Tuesday night, and I'd been thinking about my holding role for the last several days. It came to mind when I was reflecting on the fact that I was feeling quite cheerful and strong, even though I'd had a kind of tough conversation at work this week. It's quite common for me to lose sleep and obsess over what I said or didn't say, did or didn't do in situations like that. Yet, even though I was not thrilled with all that had occurred, this time I was finding it a lot easier to let it pass, to put it behind me, and move on. Why was that? Well, that's when I remembered the holding-the-garage-door story. My arms are weak and trembled when trying to hold up that heavy garage door. But God's arms are strong. Simplistic, maybe, but I am grateful that this time I was able to rest in his strong arms and be at peace.